Japanese auteur Yasujiro Ozu is best known for crafting quiet family dramas about the relationship between parents and their children. In Still Walking, Kore-Eda Hirokazu seems to be evoking the old master's spirit with a tender and deeply observant tale of coming home again. 40 years old and currently between jobs, Ryota Yokoyama (Hiroshi Abe), is returning home with his new wife (Yui Natsukawa) and young step son for the anniversary of his older brother's tragic death, who died while trying to save a young boy from drowning 15 years ago. Ryo isn't enthused at the prospect of spending time with his old fashioned parents, much less spending the night with them, but he puts his game face on for the sake of the family. His father, Kyohei (Harada Yoshio), a retired doctor, feels a certain resentment toward Ryo, an art restoration expert, and disapproves of his marriage to a widowed single mother. His eldest son, Junpei, had wanted to carry on the family legacy and be a doctor, and was in line to be his heir. Without him, he feels a sense of failure. 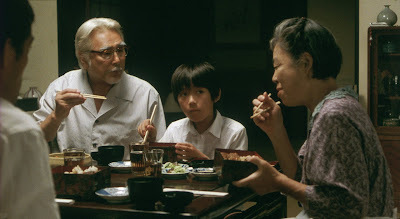 Harada Yoshio as Yokoyama Kyohei, Tanaka Shohei as Yukari's son, and Kiki Kirin as Yokoyama Toshiko in STILL WALKING directed by Kore Eda Hirokazu. Photo credit ©2008 STILL WALKING Production Committe. An IFC Films release. Ryo's mother, Toshiko (Kiki Kirin), is every bit the loving mother she should be, but has a very definite view of how she thinks things should be, and isn't afraid to voice her opinion. She, too, has doubts about a marriage to a widow, and worries how it will affect her having biological grandchildren. She is busy playing host to a house full of guests, including her daughter, Chinami (You), along with her husband and children (who want to expand the house and move in), and keeping them all fed and happy is her top priority. It's a normal, domestic scene, and Kore-Eda stages it with an effortless naturalism. The Yokoyama family feels like a real family just like any other, with all their peculiarities and faults. This is how real families talk to each other, and Kore-Eda displays a keen ear for dialogue and detail. As the day wears on, old wounds are opened and tensions are ignited, but always in a very subtle way. There are no explosive fireworks or histrionics here, just understated emotions, often unspoken, that have been years in the making. Kore-Eda wisely steps back and allows the characters to speak for themselves, never pushing the audience or manipulating the natural emotions of the story. Ryo is exasperated with his parents, watching his mother invite the boy Junpei saved from drowning in order to satisfy her own need to force someone to share her grief, making off hand comments about marrying widows, engaging in odd superstitions, and being generally distant. It is an annual affair that he is tired of going through, and all he wants to do is get through it and go home. 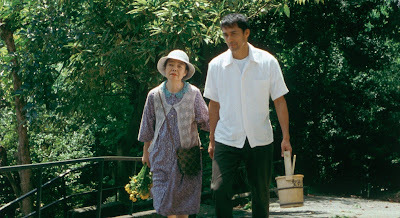 Kiki Kirin as Yokoyama Toshiko and Abe Hiroshi as Yokoyama Ryota in STILL WALKING directed by Kore Eda Hirokazu. Photo credit ©2008 STILL WALKING Production Committe. An IFC Films release. And that is where the spirit of Ozu comes hauntingly to the fore. Still Walking is, first and foremost, a film about missed opportunities. Ryo is a son who really doesn't want to come home. It's an annual, obligatory chore that he could easily dispense with. He would rather not deal with his father's stern disapproval or his mother's doting concerns, he would rather not disappoint them by telling them he is currently unemployed, but as annoying as they can be, it's all out of love for their children. In many ways, Still Walking recalls Ozu's masterpiece, Tokyo Story, a tale of an elderly couple whose children no longer have time for them. While it is unmistakably an homage to Ozu, Kore-Eda stops short of directly copying him, making Still Walking a kind of thematic extension of Ozu's ideas. Like Ozu, Kore-Eda seeks not really to warn us, but to gently remind us of the importance of family, and he does so with beauty and grace. The Yokoyama family could be any family in any country. They are a mirror for the audience, a small reminder of chances missed. Still Walking hits all the right notes, achieving a kind of simple perfection. It's a tonally acute and deeply observant tale of familial love whose quiet confidence leaves a profound emotional impact, and it works so well because it feels like home. And that is the mark of great filmmaking in any language. 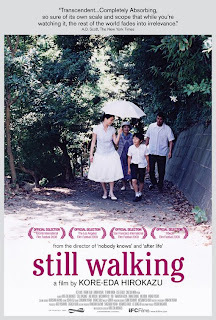 STILL WALKING; Directed by Kore-Eda Hirokazu; Stars Hiroshi Abe, Yui Natsukawa, You, Kiki Kirin, Harada Yoshio, Tanaka Shohei; Not Rated; In Japanese w/English subtitles.